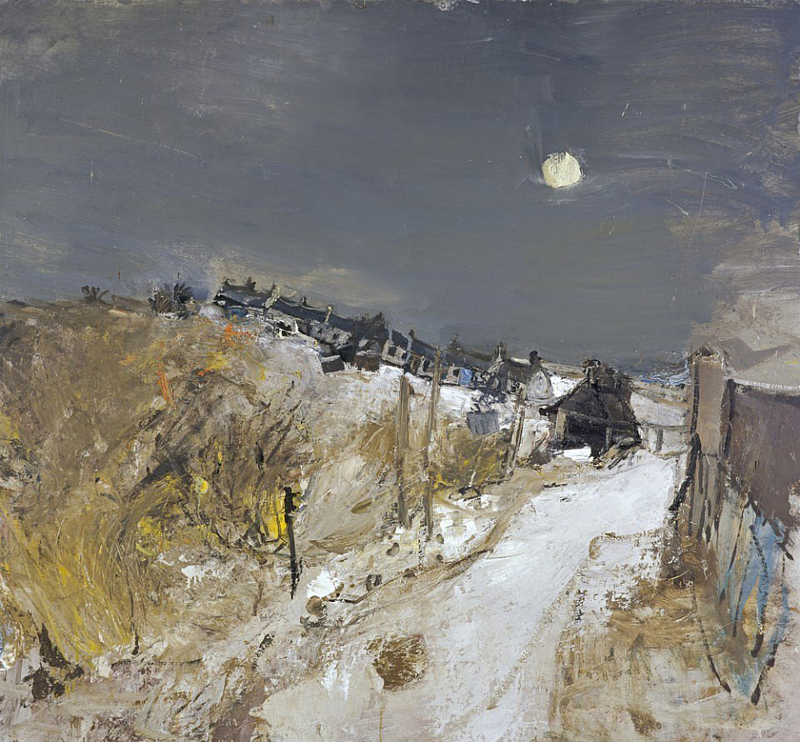 A pair of paintings by Scottish artist Joan Eardley constitute the starting point of Helen Grime‘s new two-part work, premièred last week at the Proms, Two Eardley Pictures. 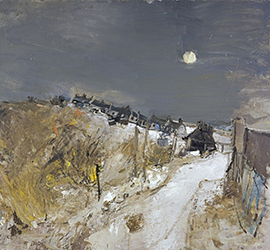 The paintings are of the same place, the Scottish coastal village of Catterline (where Eardley lived and worked), painted from similar but subtly different viewpoints, both portraying its houses and fields beneath the sullen grey of a heavy, immense winter sky. They’re beautiful images, conveying a directness and authenticity that immediately pull one into their biting chilly freshness. 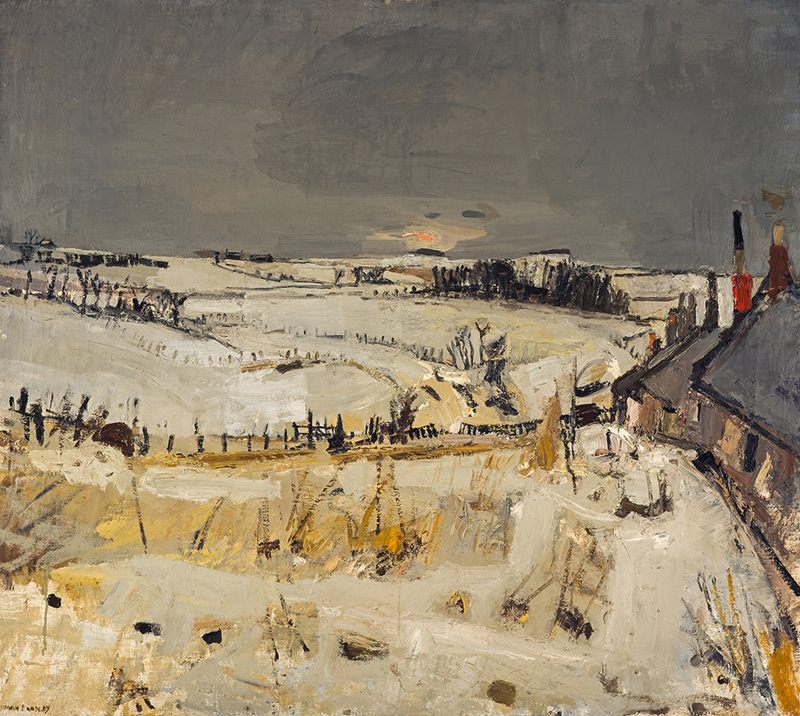 It takes a certain amount of goodwill to find parallels in the music Grime has composed; aesthetically, it often sounds worlds apart from Eardley’s winterscapes. To an extent, it continues a two-fold concern i’ve expressed about Grime’s work in the past, bound up in a hackneyed approach to material and, particularly, orchestration (Julian Anderson and Oliver Knussen continually leap to mind), in tandem with a surprisingly narrow compositional language. This blighted a CD of her music released a couple of years ago; i wrote then about her propensity to “take a drawn-out melodic line, put it mid-register and not too loud, adorn it with sharp staccato notes (woodwind or pizzicato strings) and far, far beneath it have grumbling deep bass phrases“, and this is again what we find manifesting itself here, particularly in Catterline in Winter. Principally, this emerges from two superimposed layers, one obsessed with endless runs, the other featuring slower-moving music. Perhaps it’s because of the heavily demarcated way she tends to write that passages of obfuscation come as a relief, but there’s more to it than that: Grime is overwhelmingly at her best when she has the courage to eschew such obvious and easy forms of well-trodden clarity and opts instead to follow her nose into altogether more vague and uncertain territory. Catterline in Winter does this at a point midway through, before these layers emerge, and later when any trace of lower registers is for a time erased. Here, something much, much closer to Eardley’s evocative earthiness comes through, and it’s really very special when it does. These moments are the exception rather than the rule in both pieces, but they seem to pervade the second of them, Snow, much more, despite the considerable presence of yet more in-your-face bouts of pell-mell scurrying and rude melodic pointing (Grime seriously needs to lay off the pizzicati). It’s because there’s a greater sense here that a kind of nebulosity is omnipresent, underlying all the superficial mayhem which, ultimately, becomes eroded away. It’s perhaps being a touch generous to say that’s the deliberate point of Snow, as Grime clearly also wants to give some attention to a charming ‘bothy ballad‘ titled ‘The Scranky Black Farmer’ (which you can hear in its original form here; the words are here)—although, as with the paintings, the relationship to this material is arguably more aspirational and/or stylised than correlative. 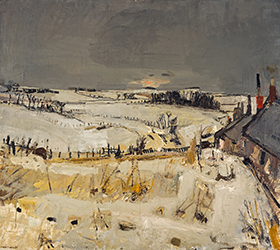 But regardless of compositional intent, the music’s gradual receding into less distinct musical ideas is welcome and effective, escaping the entrenched, clichéd mannerisms that afflict too many of Grime’s pieces, and which above all make a plausible aesthetic connection to Eardley’s paintings. The pieces were premièred separately, appropriately enough by Scottish orchestras, Catterline in Winter by the BBC Scottish Symphony Orchestra under Thomas Dausgaard, Snow by the National Youth Orchestra of Scotland under Ilan Volkov. 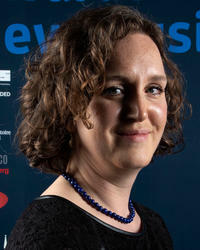 Prior to the first première, in a Proms Extra conversation, Grime remarked how Eardley “always found new things to say, and that’s something I’m trying to do in my music”; the answer to this surely lies in those all-too-brief but oh-so-telling moments in the Two Eardley Pictures when Grime allows the otherwise incessant clarity to yield to amorphousness and ambiguity, when her ideas, paradoxically, speak the most loudly and directly.